Many times, local heroes for wildlife are seldom honored for their work, mostly funded out of their own pockets but well worth the effort to express their passion for great causes. Here's one of our own in Austin, Texas: Pamela Leal, a hardworking advocate for wildlife, raising awareness of the poaching crisis and adoption opportunities for the baby orphan elephants abandoned and left to die. 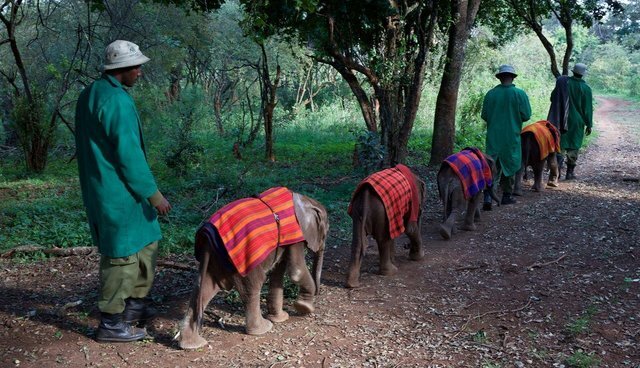 Rescued by one of the world's most effective NGOs working on the front lines to rescue and rehabilitate elephants for return to the wild, The David Sheldrick Wildlife Trust, is beloved around the world. Here's the story of Pamela Leal, one of their biggest fans working right here in Texas every year to support their work to save the orphans. When did you get interested in helping wildlife? When did you find out about The David Sheldrick Wildlife Trust? I have always been an animal lover. My mom loved elephants and would not take me to any circus in my home town of Harlingen. She raised me to be an animal lover and protector. I was looking for a Valentine's gift for my kids in February 2010. I used the search words "elephant orphanage" and The David Sheldrick Wildlife Trust (DSWT) came up. At that time, I adopted Sites for Logan and Niapoki for Meghan. When we planned our 2011 trip to East Africa, I made sure we could fit in a visit to the DSWT nursery in Nairobi, Kenya to see our babies. We got to see both of them, Naipoki is now at the Voi stockades and Sites is at the Ithumba stockades. These are both DSWT reintegration areas and the babies spend most of their day surrounded by wild elephants. We were lucky to be able to visit Naipoki at Voi this past August 2015. When did you go to Africa to see the orphans? The first time we went to East Africa and visited with our babies was July 2011 - Logan's Sites and Meghan's Naipoki. We have continued to foster Naipoki since 2010. She is 6 1/2 years old now and we had the pleasure of loving on her this last August at the Voi stockades. We fostered Lima Lima in 2014. Last year, we helped fund a taller enclosure for the baby giraffe, Kele. She passed away a few months later and I was heartbroken. At this time, Pea and Pod, 2 orphaned ostriches, live in Kele's old stockade. What action did you take to help The David Sheldrick Wildlife Trust? When I returned from my first visit to Kenya, I knew I wanted to do more for the DSWT and orphan elephants. I left part of me there and I was a different person. I started planning my first benefit which occurred in November 2012. And I took part in the Global Walk for Elephants and Rhinos ATX in 2014 and marched with my DSWT banners and flag. How many fundraisers have you produced? My first benefit was very small and was held at Empire Automotive on 7th street in Austin, Texas in November 2012. We only raised $1500.00. It was two years later that I asked The Oasis Restaurant on Lake Travis if we could use their facility for a benefit. At this point, I wanted the Lakeway and Austin businesses and artists to get involved. We had a very successful 2nd benefit in October 2014 raising more than $4800.00. I knew for the next fundraiser event, I wanted to be in a more visible place so I was lucky that the Lippincott's, who own Guero's Taco Bart, allowed me to use their patio on a Saturday afternoon. I started requesting donations and planning the event six months before our October 2015 event. I was able to acquire more than 50 silent auction items. With each event I learn something new and so happy to see the increased awareness of the plight of elephants. When did your family become involved? My two youngest kids, Logan now 25 and Meghan now 29, have traveled with me to Africa three times now. They realize first hand what it is like to visit such awesome countries in Africa. My oldest daughter Ashley, who has a family and unable to travel with me, helps every year with donation requests and at the event. Everyone in my family plus wonderful friends come to support my efforts to raise awareness and help with my benefit. My husband, Carlos, also gets evolved with the benefit process. How has the Austin community responded to you raising awareness? Because of our central location, South Congress (SoCo), in Austin we were able to increase awareness of the DSWT. We had a 70 inch (thanks Darryl Wilson & Freeman) monitor for videos showcasing elephant rescues, visits at the nursery and reintegration areas so the public could witness the work of the DSWT. The people at the benefit loved the videos. I also had my sponsors' logos visible on the screen. Without their generosity and help I could not have had a successful benefit. What is the worst thing happening now that contributes to the poaching crisis? The governments of many African counties are corrupt! China has come in with lots of money to put in roads that disrupt wildlife corridors. Also, the Chinese have greased the palms of the government so that wildlife trophies, elephant tusks, and rhino horn can be smuggled out of these countries and shipped to China. Until the government realizes that when the animals are gone, so are the tourists! Do you feel your work is helping? by supporting DSWT to meet the challenges? I wish I could raise more money for the DSWT but I realize that my efforts are helping in many ways. When you increase awareness, this increases the public's interest in important issues going on in Africa. Each year I have raised more money, had more adoptions, brought in more donations, and increased awareness in the Austin area. I feel proud of what I am doing and will continue to fundraise year after year. I have been very lucky to actually see the amazing DSWT nursery and the Voi stockades and the orphans there. Voi is run by the awesome, Joseph, who is an angel!!! My heart is so full for the love of wildlife, especially elephants. When I see the look in a youngster's eyes when they adopt an elephant, see my large posters of the babies, and I get great questions from them and their parents, I know I am making a difference. It is the youth of this country that will need to lead the change in our perceptions of animal welfare. On our most recent visit to the Nairobi nursery, it was great to see more children there with their parents. We must get the information out to the day care centers, private schools, and our public school systems here in Austin. When we get the kids involved things will happen!! Thank you, Pamela Leal, for bringing this critical issue to the attention of Austin communities who care about endangered species! We join with you to fight against extinction! © 2016 Photo above is courtesy of The David Sheldrick Wildlife Trust and protected by copyright law. All rights reserved.